The Birim Central Municipal Assembly is to enforce strict by-laws on its sanitation rules to ensure decent sanitary conditions in the Municipality. Speaking at the weekend during Birim Central's turn of the April edition of the National Sanitation Day exercise, the Municipal Chief Executive, Mr Kwabena Bempong said beginning from ending of April 2019, all shop owners and market women who refuse to participate in the exercise will be dragged to court. Mr Bempong noted that the institution of such measures will transform the Municipality into one of the most promising cities with no filth in the country. He said the laws will vest authority in government to sanction any residents who fail to participate in the exercise. Mr Bempong stated that Sanitation Day was a good exercise but “because it was not backed by any law people take it as a voluntary exercise which they may either decide to participate or not”. He was adamant that the sanitation conditions within the various communities were the responsibility of the residents and not the Assembly. “I am not expected to come to your community and clean your house and gutters for you. Once a while, we will do that; but it is not my responsibility. It is your responsibility”, Mr Bempong told a shop owner. According to him the education of the public will create more awareness and evoke the consciousness of residents not to dump refuse at unauthorized palaces and promised to resource the Information Services Department of the Municipality, who are vested in educating the public to effectively carry out that mandate immediately. The Municipal Coordinating Director Mr Douglas N.K Annoful also backed the call for promulgating laws to enforce the National Sanitation Day. 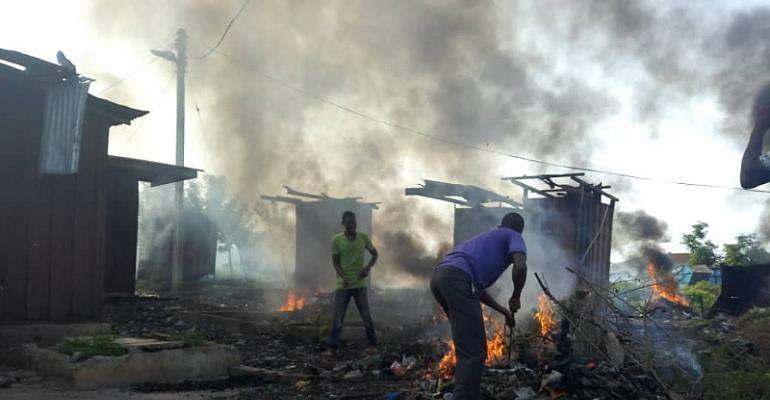 This according to him will compel residents to actively participate in the monthly clean-up exercise. Mr Annoful, however, cautioned all intrude shop owners in the central stores to revert their structures to the original boundary within their shops to pave way for fire tenders in case of any eventualities. In an interview, the Environmental Health Analyst of the Assembly, Mr Ebenezer Atsu indicated that the Ministry of Local Government and Rural Development set the first Saturday of every month aside to clean the environment but reports in the Municipality indicated that residents in some communities have developed apathy and indifference towards the exercise. He added that the exercise held in March last month was poorly patronized, prompting officials of the Assembly to put in more measures to whip up interest in subsequent months. The latest clean-up exercise which took place last Saturday 6th April also recorded poor patronage, a situation the Assembly blamed on the failure of the various groups to appreciate the rationale behind the establishment of the exercise.